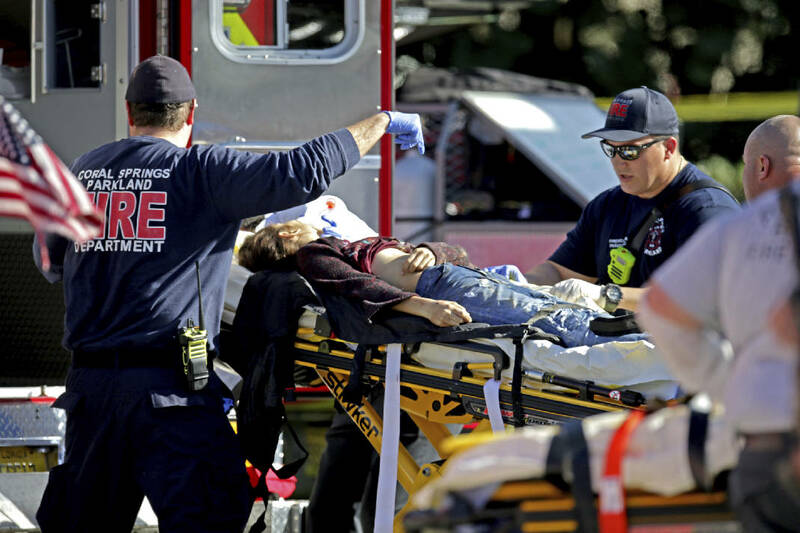 PARKLAND, Fla. (AP) — A former student opened fire with a semi-automatic rifle at a Florida high school Wednesday, killing at least 17 people and sending hundreds of students fleeing into the streets in the nation's deadliest school shooting since a gunman attacked an elementary school in Newtown, Connecticut. The shooter, who was equipped with a gas mask and smoke grenades, set off a fire alarm to draw students out of classrooms shortly before the day ended at one of the state's largest schools, officials said. "It's catastrophic. There really are no words," Broward County Sheriff Scott Israel told reporters. The attacker used the fire alarm "so the kids would come pouring out of the classrooms into the hall," Sen. Bill Nelson told CNN. The Florida Democrat said he did not know if the gunman used the smoke grenades, but he assumed that's why he had a gas mask on. Victoria Olvera, a junior at the school, said Cruz was expelled last school year because he got into a fight with his ex-girlfriend's new boyfriend. She said he had been abusive to his girlfriend. Dakota Mutchler, another junior, said he used to be friends with Cruz. But he cut off the friendship as Cruz's behavior "started progressively getting a little more weird." Cruz posted on Instagram about killing animals and threatened one of Mutchler's friends, he said. Cruz "was that weird kid that you see ... like a loner," he said. "We were in the corner, away from the windows," he said. "The teacher locked the door and turned off the light. I thought maybe I could die or something." "All I heard was 'Get on the ground! Get on the ground!'" Nembhard said. He said the man did as he was told. Beth Feingold said her daughter, Brittani, sent a text that said, "We're on code red. I'm fine," but sent another text shortly afterward saying, "Mom, I'm so scared." She was later able to escape. "It was crazy and my daughter wasn't answering her phone." She finally texted him that she was inside a closet with friends. A few minutes later, he texted again, "I'm fine." Murray said he's had just one thought running through his mind since his son's text: "All I keep thinking about is when I dropped him off this morning. I usually say, 'I love you,' and I didn't this morning. He's 17, he's at that age. And I didn't say it this morning, and I'm just kicking myself right now over and over and over."